Be the first to share your favorite memory, photo or story of Lindle. This memorial page is dedicated for family, friends and future generations to celebrate the life of their loved one. Lindle (Toots) Lillard, 93 year old Woodward resident, died Tuesday, November 20, 2018 at her home. Funeral services will be held at 10:00 a.m. Monday, November 26, 2018 in the Billings Funeral Home Chapel. Burial will follow in the Elmwood Cemetery. 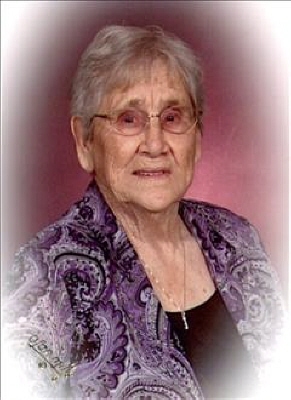 Visitation will be at the funeral home on Saturday from 9:00 a.m. until 12:00 p.m. and Sunday from 9:00 a.m. until 8:00 p.m.
Toots was born October 16, 1925 in Ada, Oklahoma, to Amos and Ophia Brandon. She attended school in Byng, Oklahoma. She was very active in sports. She played basketball under Coach Bertha Teague, and even played baseball on the boys team during the war. After she completed school, Toots married Lowell Lillard, on October 30, 1943. To this beautiful union they added five children. Toots was never one to shy away from hard work. She had many different jobs throughout life, but her most important job always was their family. She also stayed active playing basketball on the Pink Panthers into her 50's. After they retired they trained and raced horses. Many memories came away from the Winners Circle. After horse racing Toots worked at Braums, and spent the rest of her time spoiling her ever growing family. Toots was not much for words, but you knew if you received baked goods out of her phenomenal kitchen you were loved. Toots was preceded in death by her husband Lowell, her parents, sisters Lanell Mace and Laverne (Dutch) Clark, brothers Leroy Brandon and Leonard Brandon. She is survived by her children: Netha Rohrer, Dr. Charles and Suzann Lillard, Lonnie and LeAnn Lillard, Dewight and Kelly Lillard, and Kirby and Brooke Lillard; siblings: Cricket Whitesell, Lawana Hernandez, John Brandon, LD Brandon, and Wayne Brandon; grandchildren: Ayme and Andrew, Matthew and Lora, Vernon and Jean, Roxy and Joe, Eric and Carla, Lori and Trent, Jimmy and Morgan, April and Ed, Mandy and Alan, Kyle, Andrew, Misti and Matt, Larissa, Lacey, Chelsea and Chaz, Levi, Landyn, and Layten; 24 great-grandchildren; two great-great-grandchildren; and special friends, Jodi Jones, Patti Crow, Belinda Ward, and Chandra Hall and last but not least her faithful dog, Arthur; plus many other friends and family. Memorial contributions may be made to the WOOF Pet Rescue with the funeral home accepting the contributions. To send flowers or a remembrance gift to the family of Lindle "Toots" Lillard, please visit our Tribute Store. "Email Address" would like to share the life celebration of Lindle "Toots" Lillard. Click on the "link" to go to share a favorite memory or leave a condolence message for the family.